The Test of Proficiency in Korean will include a speaking test starting in 2023, local media outlets reported Sunday. 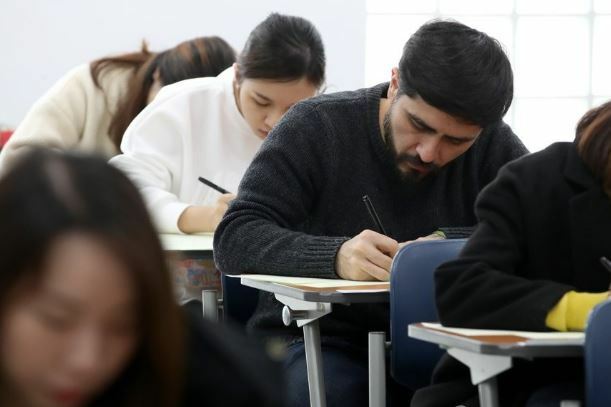 According to the reports, the National Institute for International Education, which administers the TOPIK, has plans to incorporate a speaking test into the exam and change its format to internet-based testing. TOPIK is a written test held six times a year and designed to evaluate the Korean-language skills of nonnative speakers. Many test takers hope to gain employment in South Korea or admission to a Korean university. The number of test takers has increased steadily since 2014, when 208,448 people took the test in 66 countries. In 2018, the test was administered in 78 countries and 329,224 people sat for the exam. The test is divided into three parts: reading, writing and listening. The lack of a section to measure a person’s Korean speaking ability has caused concern within the business and academic communities. NIIED recently unveiled its four-year plan for the implementation of a speaking section. The institute will develop questions and scoring standards in 2019 and carry out two sample tests. When the funds needed to implement the plan are secured, NIIED will start building the IBT system in 2020 and 2021 and will train examiners and graders. Once the IBT system is in place and the scoring criteria are set in 2022, the institute will launch the speaking section on two occasions in 2023 for 5,000 test takers. The number of individuals who can take the speaking test will gradually be increased to 10,000 in 2024, 20,000 in 2025 and 50,000 in 2027. NIIED said it will change the listening, reading and writing tests to suit the internet-based exam format, once the speaking tests are in place and are deemed to be running smoothly.